Rain gardens are a beautiful and practical way to absorb stormwater and reduce rurunoff, provide food and habitat for pollinators and other insects and animals and enhance your property and protect your shoreline. Learn how to assess your soil for the best location, choose native plants suited to your property, installation techniques, and contact information for state and local resources. 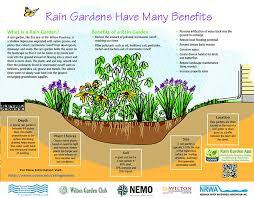 Obtain a free copy of “The Vermont Rain Garden Manual”. Presented by Becky Tharp, Program Manager, Green Infrastructure Collaborative, Lake Champlain Sea Grant and Department of Environmental Conservation. Sponsored by the Lake Bomoseen Association and the Lake Champlain Sea Grant Program. We are starting to wind down with our Lake Implementation Meetings and begin coming up with plans and ideas for the lake. Our next meeting is Tuesday, August 22 at 6:00 pm at the Castleton Community Center. Some of the topics will be: 1) the North End, 2) water and boat safety, 3) milfoil and harvesting, 4) shoreline protection, 5) greeters and much, much more. This is a chance to share your thoughts and opinions with the group about what you would like your lake to look like in the future. This meeting will be chaired by Ethan Swift and we hope to have Dr. Perry Thomas from the DEC there as well. Again we are hoping to have everything wrapped up by the end of October.